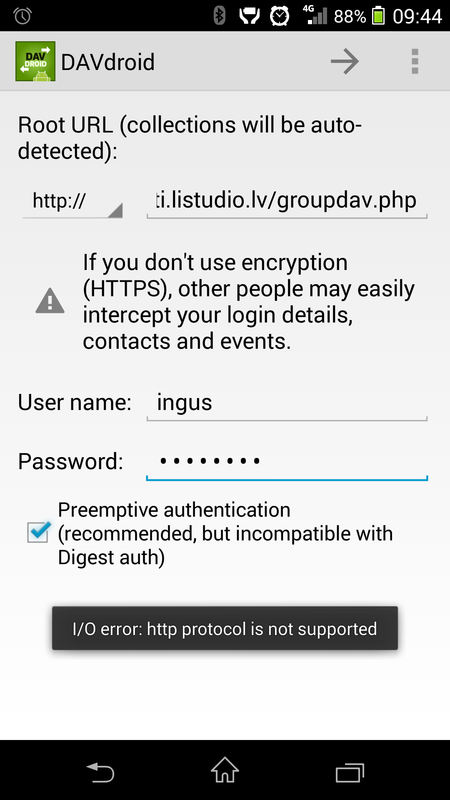 Can’t reproduce that here, HTTP is working (tried with OwnCloud demo server from http://davdroid.bitfire.at/configuration). Please give a detailed error description, including steps to reproduce. When I try to add account, davdroid actually don’t try to connect to server, it immediately show “I/O error http protocol not supported” after I pressed arrow symbol, seems it is android problem. My phone is Sony ZL with 4.3 Android. Before update everything worked ok! Hi, try to debug it a little. Please consider upgrading the build system to maven or something simillar, it will make things much easier to debug source code even for attached libraries. Also consider printing full stacktraces from 3rd party libs. EDIT: 1st time on GitHub – just created a pull request.